He thinks nothing of running at his adversaries head-on. Literally. He does not stop to think of the consequences before running in to challenge an opponent. Interestingly, the origin of the Irish Terrier breed is unknown. The best experts can figure is that he originated from Terriers in England and Ireland. 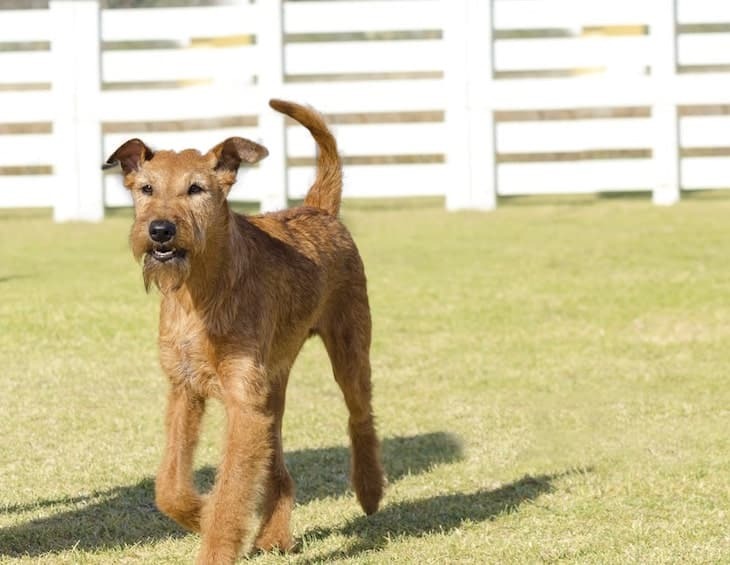 The first Irish Terriers came to the U.S. in the late nineteenth century. From there it was love at first sight, as the breed became an instant hit. 1. 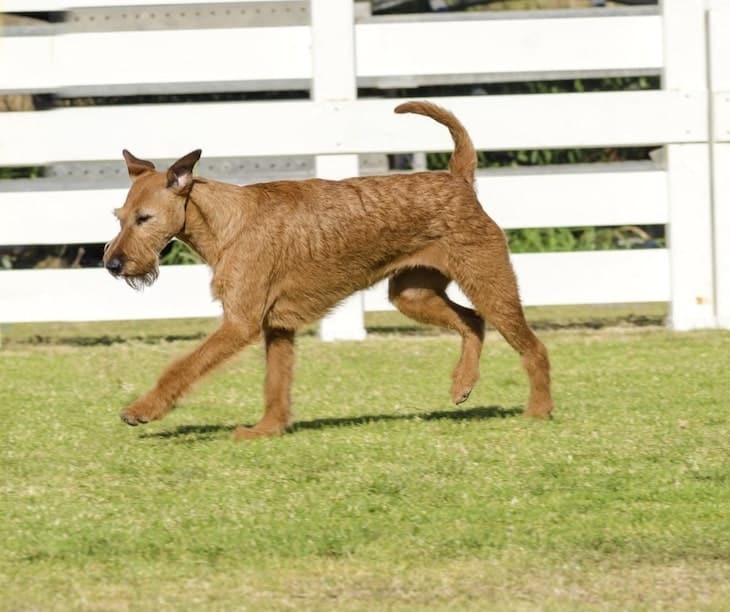 Trainable- Ironically, while you would think his daredevil attitude may make him a horror to train, the Irish Terrier is pretty trainable. 2. Dominant– He is fearless, which makes him dominant to a fault. 3. Energetic– He will happily take as much exercise as you want to give him. The Irish Terrier’s personality when it comes to strangers can vary. He can either be polite as a punch or aloof and suspicious. Even the Irish Terriers that are more agreeable to strangers still tend to be fantastic watchdogs. And that's because of their protective temperament. However, this protective tendency can make an Irish Terrier feel dominant. As his owner, you need to stay strong and persistent to keep him in check. Demonstrating that you, not him is the leader of the pack is especially true when you’re trying to housebreak him. Otherwise, he picks and chooses his moments to listen. The more active he is, the happier the both of you will be. Keep him running, jumping, chasing, and exploring as much as possible to reduce his boredom indoors. Remember, boredom leads to trouble. If you don’t challenge him, he’ll seek out other opportunities, like knocking over plants or chewing furniture. Irish Terriers can be great with kids. They both have boundless energy and can keep each other entertained and engaged. Because he has a hunting streak, he can be more aggressive with other dogs and smaller animals, like cats. Train him out of this at an early age through continued socialization. The character of “Tramp” from Disney’s film Lady and the Tramp was drawn to resemble an Irish Terrier. Tramp was gray, while the Irish Terrier is the only Terrier to be all red. During World War I, Irish Terrier breeds were messengers for military soldiers. Irish Terrier dogs have remarkable sniffers and can quickly detect the scents of humans and blood. Training an Irish Terrier is an experience. He is smart and relatively easy to train when he wants to be. He is also has a strong will and an independent streak. These traits of the Irish Terrier’s temperament can make training challenging when he’s moody. If you find it difficult to train him on your own, consider taking him to an obedience school. To help you develop a well trained Irish Terrier, you can also try this exceptional online training resource. You don’t need to bathe him often, only when necessary. One thing to note about his coat is that he must be hand-stripped twice a year. If you are uncomfortable hand-stripping him yourself, then you should bring him to a groomer to do it. The Irish Terrier has a great deal of energy, so exercise is a must. Failing that, walk him several times a day to keep him both fit and satisfied. Because the Irish Terrier temperament makes him so eager to please, he also makes a good performance dog. If you are a runner, the Irish Terrier can be a good companion. His long legs and body make him a more adept runner than his terrier cousins. A healthy Irish Terrier can live between 12 and 15 years. The Irish terrier size is, on average, 18 inches tall and between 25 and 27 pounds. Some of the more common diseases that can affect the breed, however, include eye issues, like cataracts and progressive retinal atrophy. Irish Terriers can also suffer from muscular dystrophy, though this is not as common of a condition. Hyperkeratosis, which is a thickening of the pads of the feet can also be a problem. This condition used to be more common. Thankfully, it is now rare in Irish Terriers. He is also prone to getting kidney stones more than other breeds. When in the market for Irish Terrier puppies, one thing you’ll want to know is how much you should expect to spend. On average, the Irish Terrier price tag runs between $600 and $800. This price makes the Irish Terrier one of the more affordable dogs out there. If you’re looking into Irish terriers for adoption, AdoptaPet.com lets you search for Irish setters that are available within your area. You may want to consider adopting an adult dog to avoid behavioral problems, like chewing. However, be warned that adopting an adult dog means that you may adopt a dog that has not received proper training. You may, therefore, experience great difficulty trying to get him to overcome bad habits. Click here to learn more before you adopt an Irish Terrier from a shelter. If you’re interested in supporting an Irish Terrier rescue, consider the Irish Terrier Rescue Network. This organization specializes in finding new homes for Irish Terriers whose families can no longer support them. Reasons for this include falling on hard financial times and falling ill.
Only about 300 Irish Terrier puppies are born every year. Because of their rarity, Irish Terrier breeders may charge higher prices for these puppies. When it comes to buying an Irish Terrier puppy or any dog for that matter from a Breeder, please do your homework. Always double check the American Kennel Club (AKC) Puppyfinder to find a reputable breeder. Reputable breeders who have Irish Terriers for sale are likely to be forthcoming about their dogs’ health conditions. You also should not expect to find any Irish Terrier for sale from a reputable breeder that suffers from hyperkeratosis or any other genetic health condition. Note that you may buy an Irish Terrier from a breeder that later succumb to one of the other diseases that affect the breed. In this case, you should not blame the breeder since this may not be known at birth. 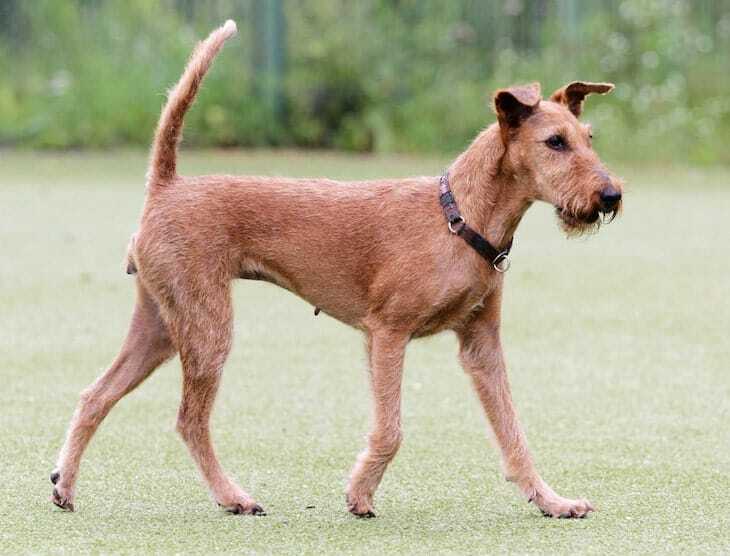 The Irish Terrier temperament makes him a lovable little scamp. He thinks nothing of heading into what could be a dangerous situation. That is because he does not consider the consequences of his actions before he makes his move. In spite of this, he is still rather trainable when he wants to be. He has a great deal of energy, so you must exercise him often. Multiple walks a day should suffice. He’s great with kids, and other dogs if you socialize him early. He can be protective and dominant, which may make training him a challenge. Remain persistent and firm to show him who’s the boss.